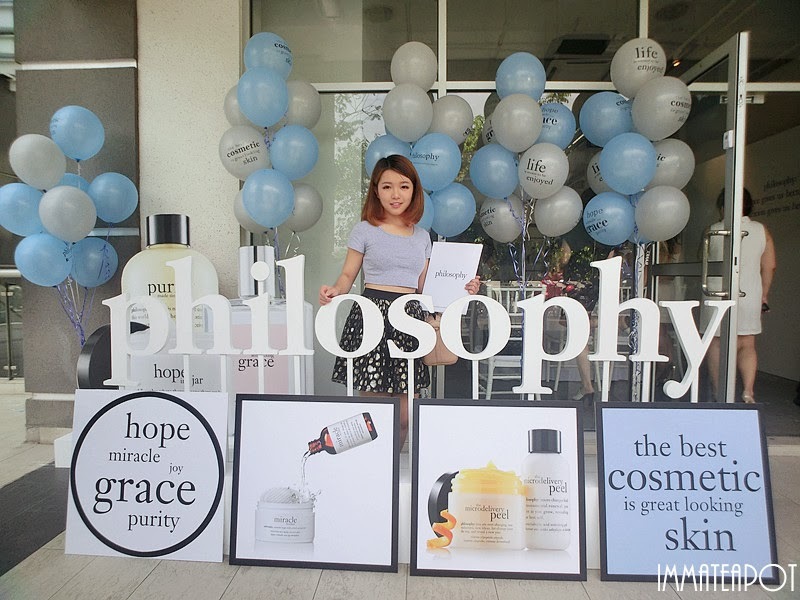 Amelie's Blog : Philosophy is now in Sephora Malaysia! It's my great pleasure to share the news with you guys, Philosophy is now in Malaysia! Actually I have shared some of the teasers earlier with you guys on Facebook and most of the beauty junkies were pretty excited, can't wait for this brand to land in Malaysia. lad to spend time with Mrs. Robin White, Director of global press for Philosophy at the launch as we have discovered more products of Philosophy from some hands on activities and most important that I got to know Philosophy more! Can you believe that she is 75 years old? She looks so young!!! *Cheers for Philosophy! * Look at the backdrop set behind, they were way gorgeous! OMG, I look so 'tall' huh standing beside Mrs. Robin =.= Gosh look at the bath tub fully filled with Philosophy Bath and Body series! I wish I can have them all with me! 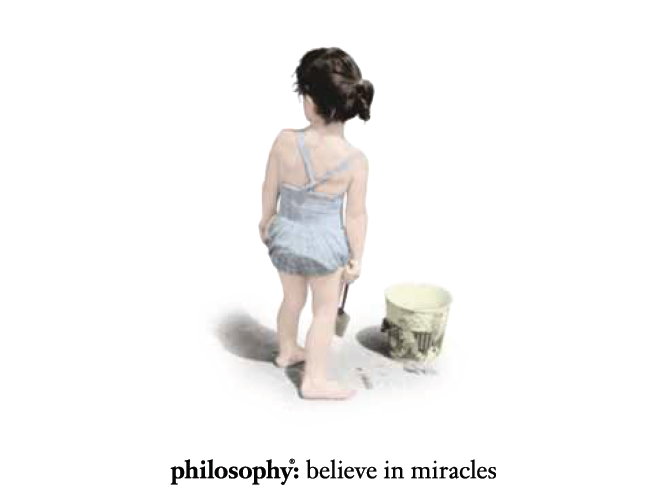 Philosophy ---- A well known brand in United State was founded by Christina Carlino in 1996. Christina was committed to inspire women to live a better life by being better to themselves by believe hope, purity, grace, miracle and peace. 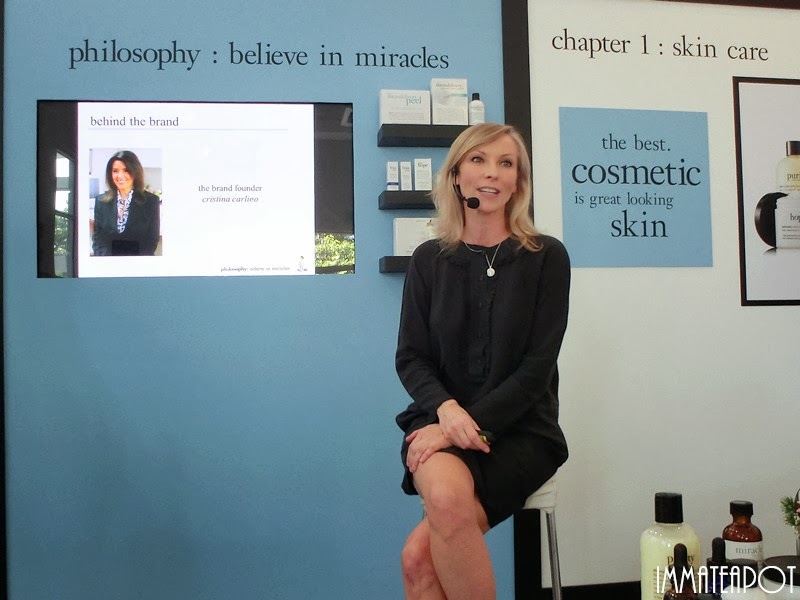 With over 30 years of experiences in biomedic, she expanded her goal to bridge the gap between what was offered in doctors' offices and retailers so that every women can access leading skin care technologies. With her strong belief in nurturing women's soul as well as skin, all the products based on a rich scientific heritage, coupled with inspirational messages to create fresh and approachable attitude toward beauty. All the formulas incorporate cutting-edge science and medically-inspired technology that deliver proven results. For every products, there are few inspirational lines, just to celebrate the beauty of human spirit, to inspire you, lift your spirits, encourage a smile and to always believe in miracles! 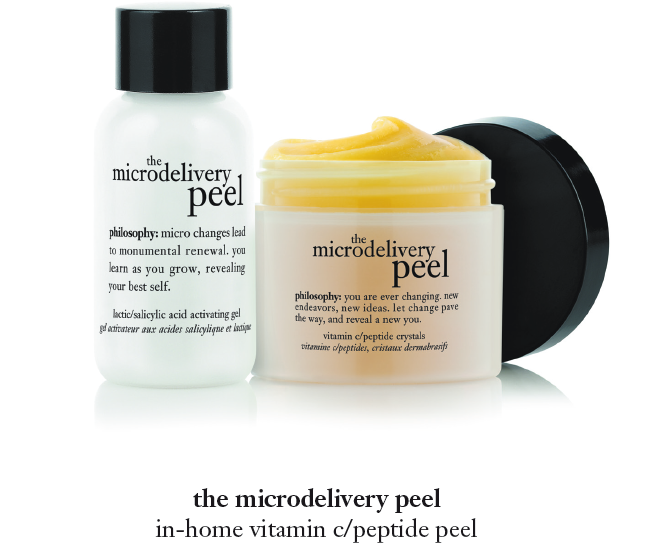 Microdelivery peel which is a 2-steps, in home peel. It can rejuvenate sun damaged, hyperpigemented and aging skin, meanwhile replenish our skin to make it smoother and more radiant by delivering vitamin C and peptide. It comes with a gentle formula and can be used as daily exfoliation.I have tried this on the spot, instantly it gives me a baby silk skin! 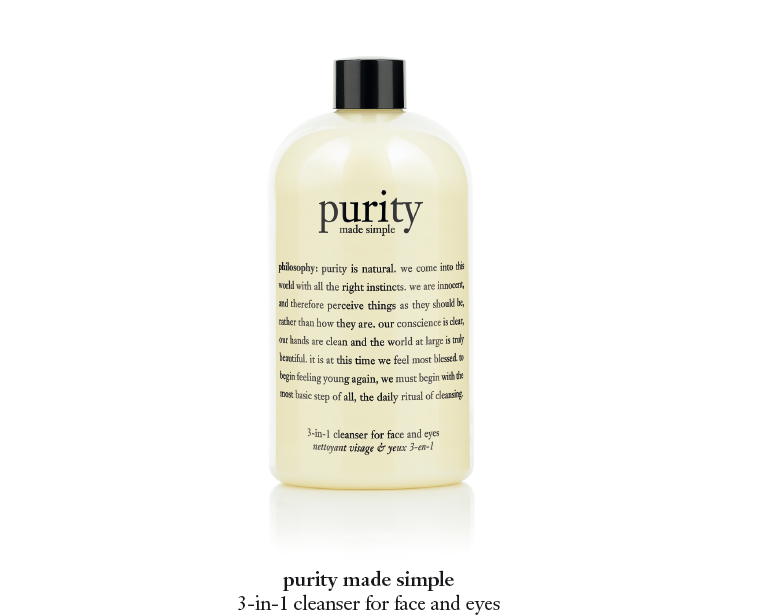 Purity Made Simple is an award winning 3-in-1 cleanser for face and eyes that removes make up, cleanses and tones our skin all in one set. It's gentle enough to apply although you are wearing contact lenses! It won't irritate your eyes and maintain skin's moisture level. 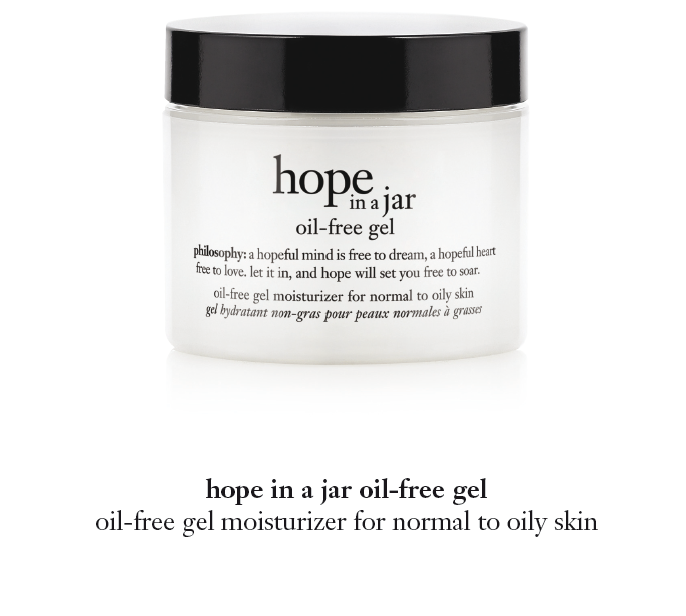 Hope in a Jar Oil Free Gel, it's a moisturizer that provides optimal hydration to revitalize skin, maintain its moisture barrier and it has antioxidant properties. I've tried this as well, it fantastically leaves our skin with comfortable hydrated matte finish, with zero stickiness feeling! 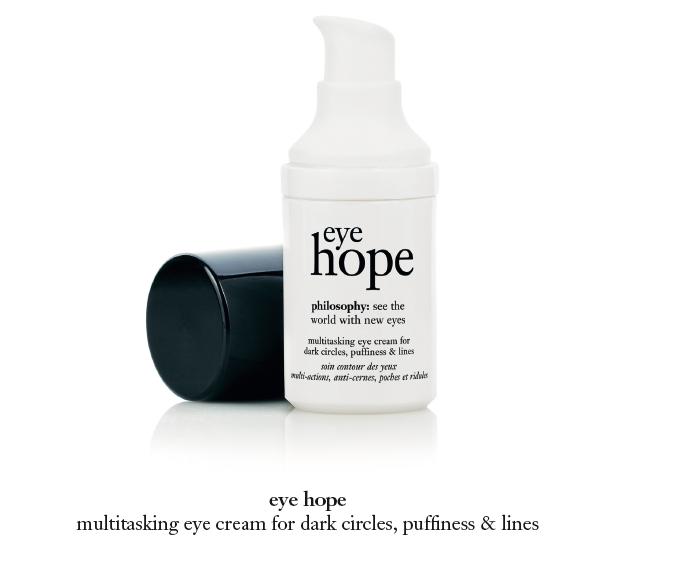 Eye hope which can reduce eye puffiness, fine lines around eyes area and dark circles! Besides, it moisturizes our eyes area as well. Guess designer should own this for always staying up late as eyes area do show sign our ages. 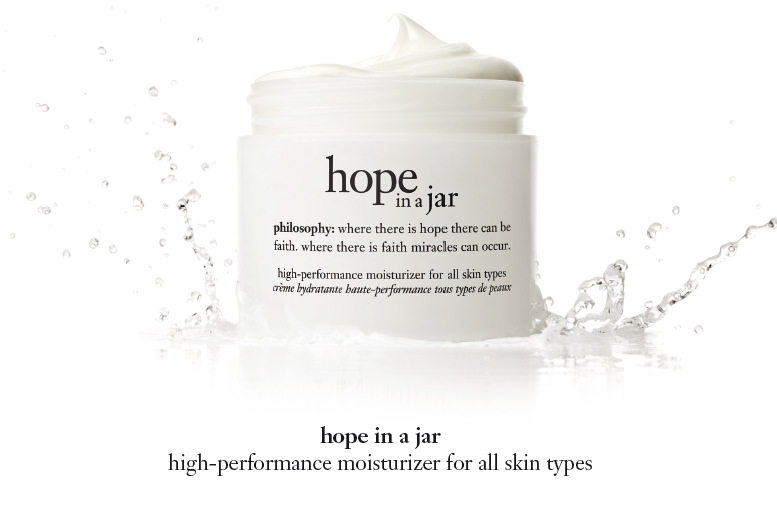 Hope in a jar, is also an award winning daily moisturizer which hydrate skin to reduce dryness and giving our skin a healthy radiant glow. 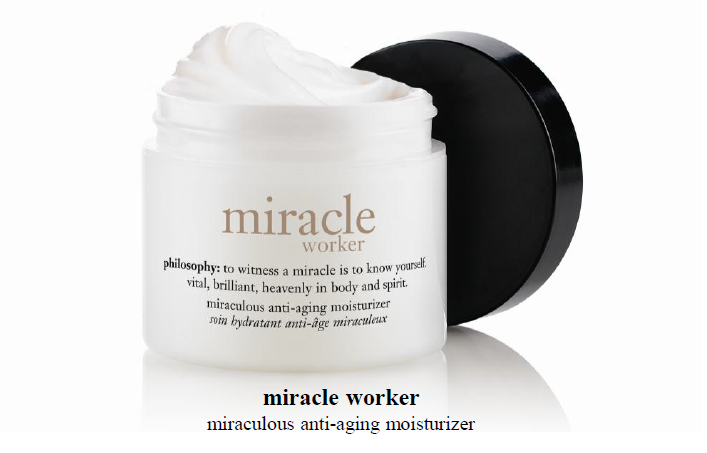 Miracle worker series - Miraculous anti-aging moisturizer, helps firm and hydrate skin. This cream features a unique complex and formulated with vitamin C, glutathione helps to support natural collagen in our skin and restore youthfulness! 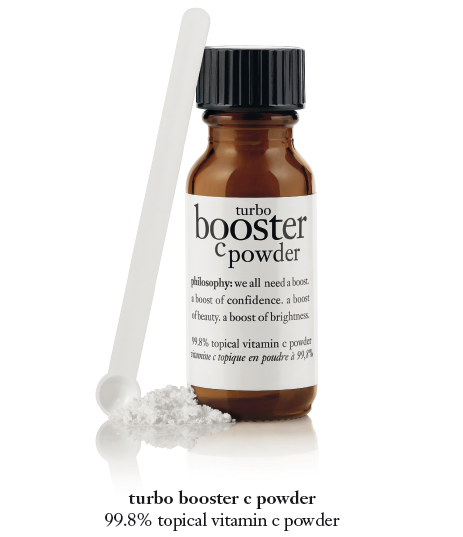 My favorite product of all, Turbo Booster C Powder which is a 99.8% high potential topical vitamin C powder that helps to prevent premature aging, support collagen and brighter our skin complexion. Add one scoop daily in your water-based skin care is enough to boost and restore elasticity of your skin! Philosophy has fabulous shower gel! All of them perform fresh and nice scent! You can use them from top to toe, even bubble bath. You gonna soak in a fantasy or fruity scent shower! formula cleanses and condition, as it delights your senses. the luscious Raspberry Sorbet, positively refreshing, feel and smell good all over with this, berry-licious! the delectable vanilla birthday cake, a scent which is too sweet for words. 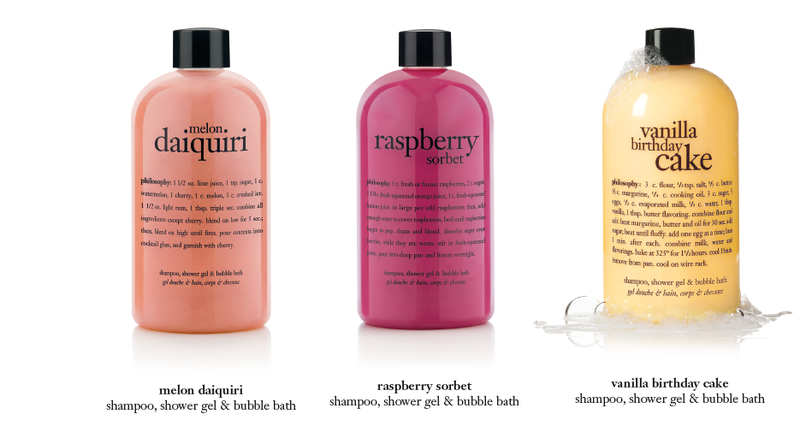 feel clean and smell good all over with this award-winning shampoo, shower gel& bubble bath. 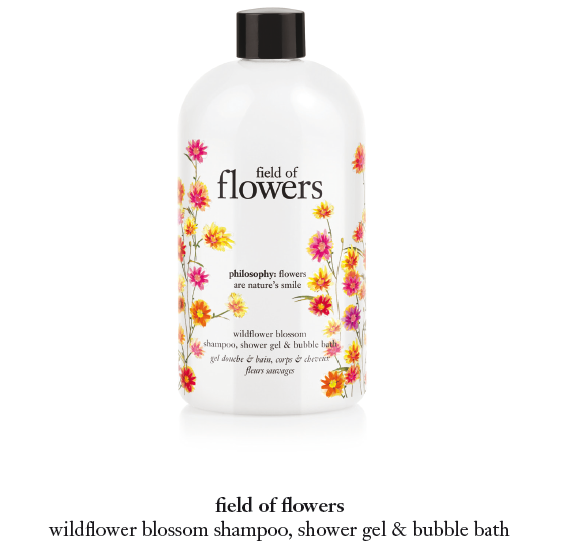 Field of Flowers, a 3-in-1 shower gel which cleanse, condition our skin and hair, while provides rich, foaming lather for a shower experience fused with fresh scent of delicate wildflowers. Philosophy also comes with gift set which make our life easier! Every Birthday Girl wants cake, make every day a celebration with Vanilla Birthday Cake shampoo, shower gel & bubble bath and Vanilla BirthdayCake high-gloss, high-flavor lip shine. the senses as it delicately scents the skin for a light veil of fragrance. and conditions skin and hair, while the fresh floral scent of peony makes you feel positively lovely. 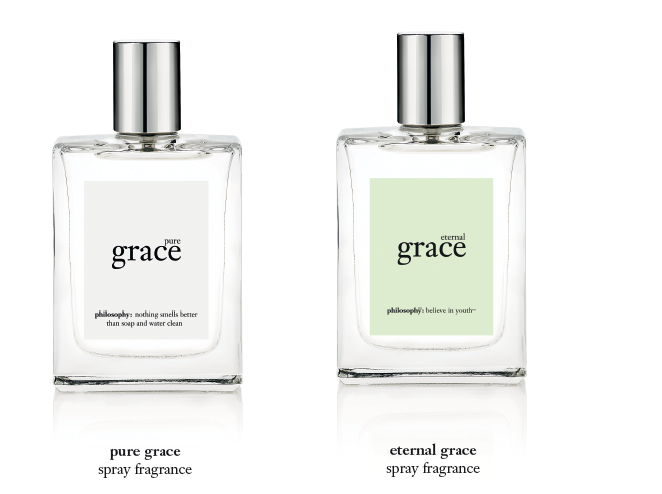 the simple, modern tones of leafy greens; and frosted musk brings a refreshing finish. of geranium, lavender, violets and a subtle hint of passion fruit. The timeless heart of the fragrance entwines the tenderness of jasmine, orange blossom and the luxuriousness of rose. 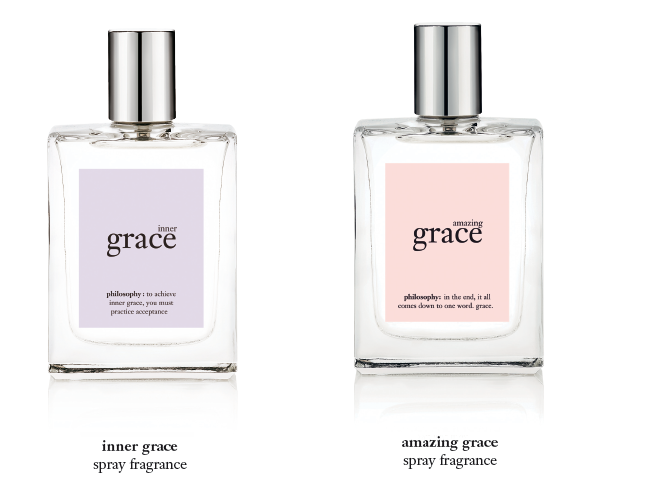 Inner grace, is perfect for those who want to free their mind and lift their spirit with a heavenly fragrance. It was created to help bring peace and balance to your life. aqua leaf imparts peaceful balance; delicate freesia offers deep spirituality; and warm, sensual musk calms your thoughts. soft, clean muguet blossoms; and lasting musk with its classic beauty. For more information of products and updates, visit Philosophy Malaysia. *All the products are available in Sephora nationwide.